The name of this square refers to an old cross which marked the town’s seigniorial fief, which belonged to the bishop and the canons of Saint-Malo up until the French Revolution. This cross marked the old entrance to the town, near the postern gate of the same name and a town wall which passed through this location in those days. After the first great town fire in 1661, the old cove called the Anse du Fief (which was also known as the Anse de Merbonne), was partially filled in using the debris, up to the point where Rue Sainte-Barbe now is, which is where the end of the town’s first wharfs was. 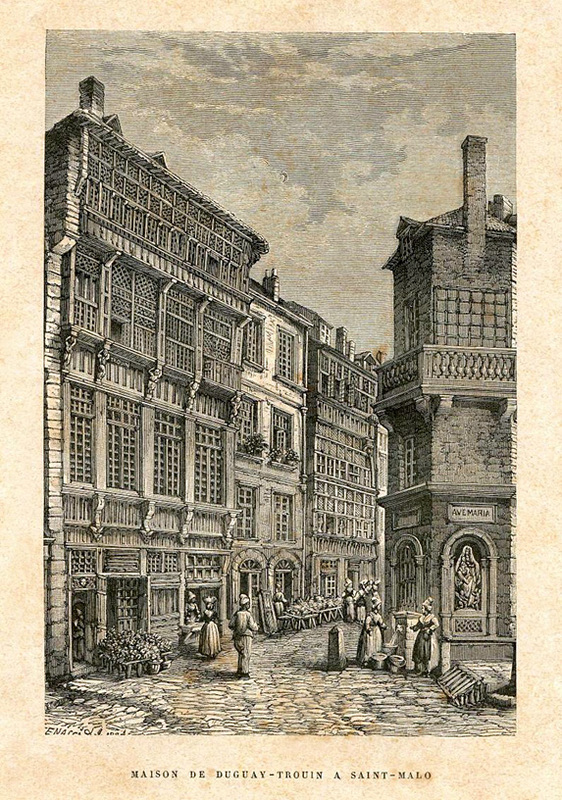 What remained of the cove, in-between this street and the current Porte Saint-Vincent, was reclaimed from 1708-1709 as part of the works forming part of the first expansion of the town. Among other things, they made it possible to open the current Rue Saint-Vincent and to enlarge the space enclosed by the ramparts. Number 2 Rue de la Corne de Cerf marks the spot where an old house with a wooden façade with stained glass windows was in the 16th century, which was destroyed in 1944, and where the famous corsair René Duguay-Trouin (Saint-Malo 1673 - Paris 1736) was born. He became famous for taking Rio de Janeiro in 1711 and became a Naval Lieutenant General. His remains were brought to Saint-Malo from Paris in 1973.